Much as I absolutely appreciate the luxury of modern technology which allows me to work in this beautiful and rural part of France and still be connected to the rest of the world, I do somehow still hanker after that simpler way of life which for many is only a distant memory but which, here in the foothills, is still very much in evidence – as you can see in this photo of my neighbours, getting around as they always do; husband at the wheel, wife precariously balanced on the back. Such style! Luxury is all relative – she doesn’t have to walk up the hill anymore! 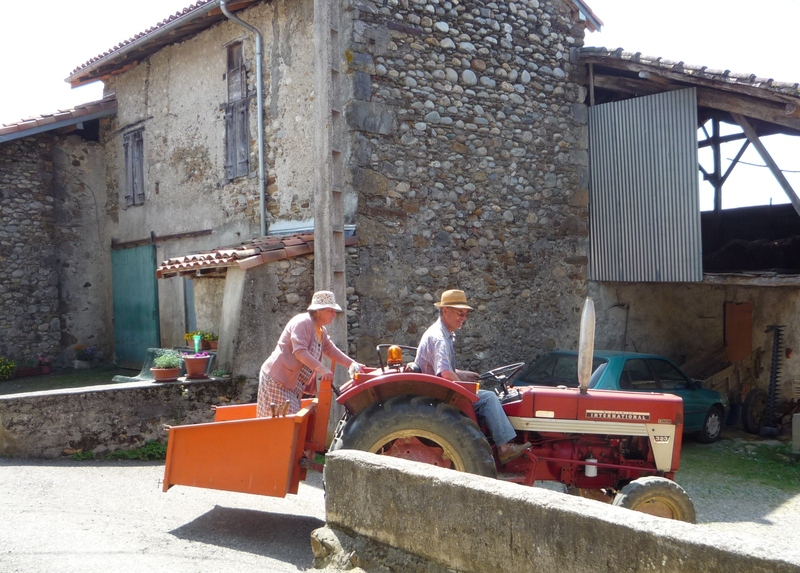 Perhaps it is the hectic pace of modern life that is encouraging more and more of us to move to France and enjoy the French lifestyle where the simpler things in life still matter. Here everything still stops for lunch – at least in this part of France – and families still make time to eat a meal together around the table at least once a day and often more. The market is still the main source of everyday foodstuffs, fresh bread every day is vital (bakeries are the only places that open on Sunday and Bank Holiday mornings) and business is still best done face-to-face in your local town. Being in a rush here is almost an admission of failure and can be used as an insult if you were to suggest that someone is perhaps pushing in front of you in a queue because he is pressé. I am by no means suggesting that everything in France is perfect; we all know that everywhere has its bad aspects as well as good. Nor am I suggesting that I really want to be transported around on the back of my husband’s tractor! I am certainly guilty of getting the balance wrong much of the time and working too many hours at the expense of leisure and family time and then beating myself up about it just like everyone else. 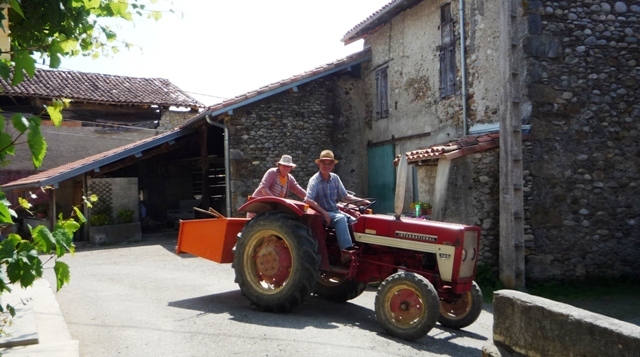 However living here is a good antidote to this – I just have to drive up my hill and see my neighbours sitting on the bench putting the world to rights with all the time in the world and it puts me straight back on track as to what is really important in life. If I lived in London I would be so carried away by the rush and stress that I know I would never take an afternoon off to go for a walk, plant my tomatoes, picnic by the river or go cycling with the children. I think it is living in France that has saved me and kept me sane and has taught me that there is lot to be said for the traditional way of life – despite how incongruous it might look in this very modern world. I certainly have never seen two more smiley and contented people than my neighbours pictured here so they are certainly doing something right!